Croton Water Celebration medal by Robert Lovett, Sr. Courtesy of John Kraljevich Americana. 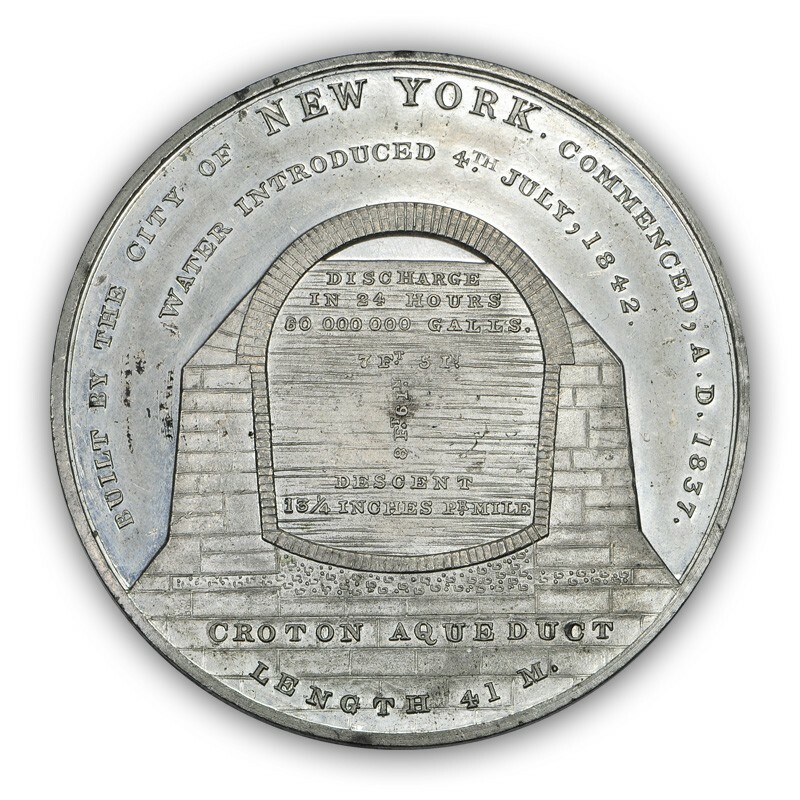 Here’s a fine example of the medal produced for the Croton Water Celebration, when what we now call the Old Croton Aqueduct opened to public use on October 14, 1842. This is currently being offered by John Kraljevich, a leading expert in American historical medals, coins, paper money and related Americana, who has graciously allowed us to share his images. The Croton Water Celebration medal was designed by Robert Lovett, Sr., the patriarch of a family of famous engravers. He was born on March 19, 1796, and grew up in a quiet New York City neighborhood in an area now covered by the western end of the Brooklyn Bridge. 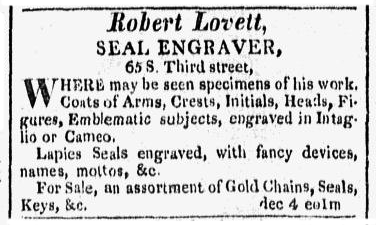 After a brief military service during the War of 1812 he apprenticed in the shop of master stone seal engraver Thomas Brown. 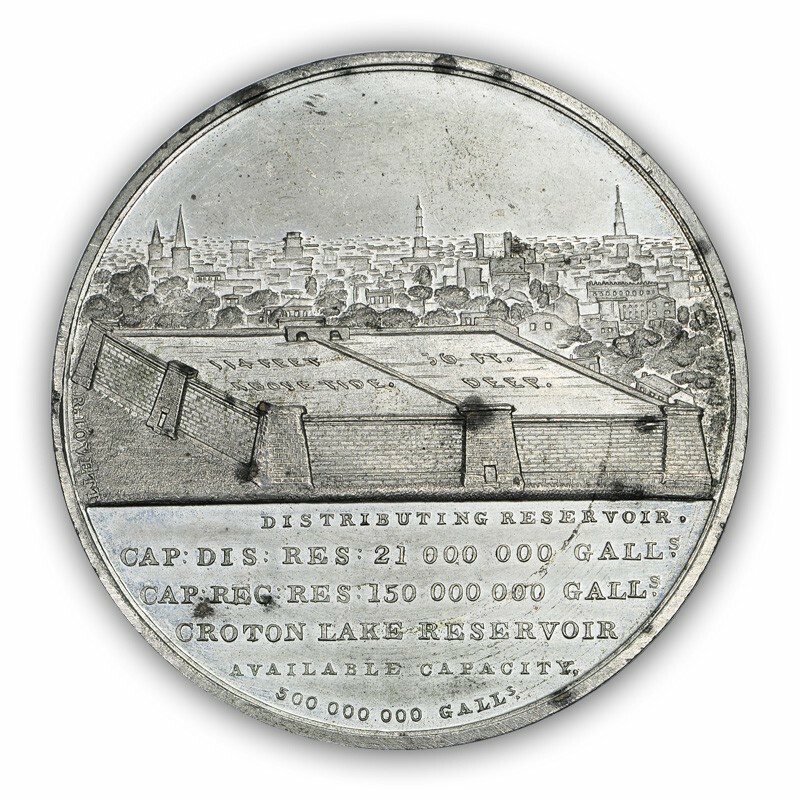 Lovett’s Croton Aqueduct Medal was produced in silver, bronze and white metal. The silver examples were individually engraved for the 17 New York City Alderman in office at the time of the celebration and various dignitaries, including poet George Pope Morris, author of the celebration’s “Croton Ode.” The example shown here is white metal. One side of Lovett’s exquisite medal is shown above and the other is below. If you want to enlarge the images to see the details click here to go to John Kraljevich Americana.